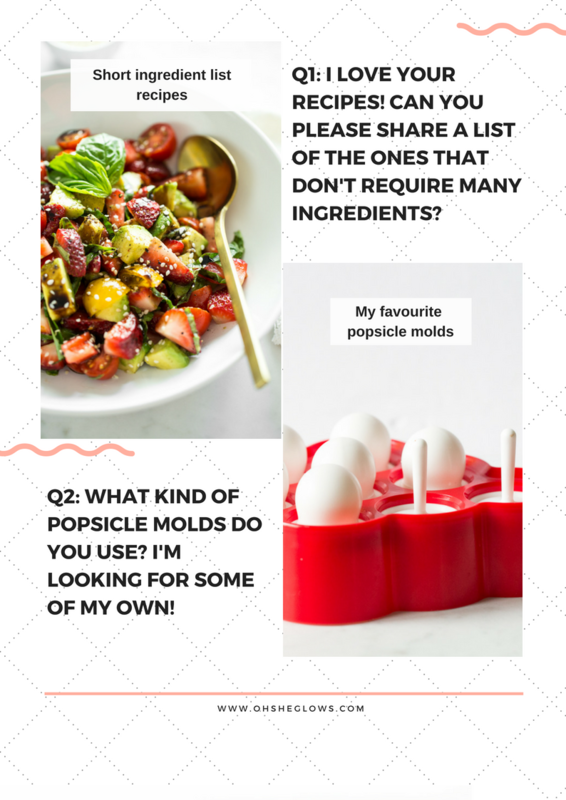 Ask Angela: OSG recipes with 5 to 7 ingredients, my favourite popsicle molds, freezer-friendly summer recipes, and more! Happy Tuesday! Before we dive into our Ask Angela Q&As, I’d like to share this short Oh She Glows Reader Survey. I’m really curious to hear what you would love to see more (or less) of to help guide the future of the blog. Your feedback and input mean the WORLD to me, and I’d be so grateful if you could take a couple minutes to fill out the survey! 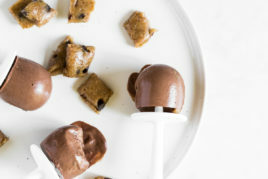 In case you missed it, don’t forget to check out last Friday’s Mini Cookie Dough Fudge Pops recipe, too. I’ve deemed these my official “treat yo self” popsicle of the summer! Q1. Hi Angela, I love your blog, app, books, and newsletter. Although I am not vegan, I am gluten- and dairy-free, so I find a lot of your recipes very helpful. I especially love those five-ingredients-or-less recipes. 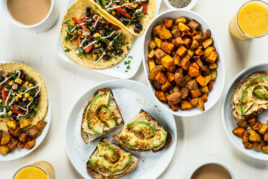 Can you list out some Oh She Glows recipes that have just a few ingredients? Keep up the great work! Hi Marion, thanks so much for your question! I’m so excited to share this new OSG blog page complete with over 50 short ingredient recipes. I hope you find it helpful—it might be handy to bookmark the page for future reference, too! A big thanks to Nicole and Terra for compiling the recipe list. Q2. What kind of popsicle molds do you use? I’m on the hunt and not sure which kind to buy! Hi there, the Zoku Mini Pop Molds are my absolute favourite—the popsicles are SO easy to remove, and I find they’re the perfect size for kids. I also have these GoGoGu Popsicle Molds for larger popsicles (although they do require running under hot water to remove from the mold). Q3. Hi Angela! My friend gave me your cookbook for my 50th birthday and now I’m a huge fan. 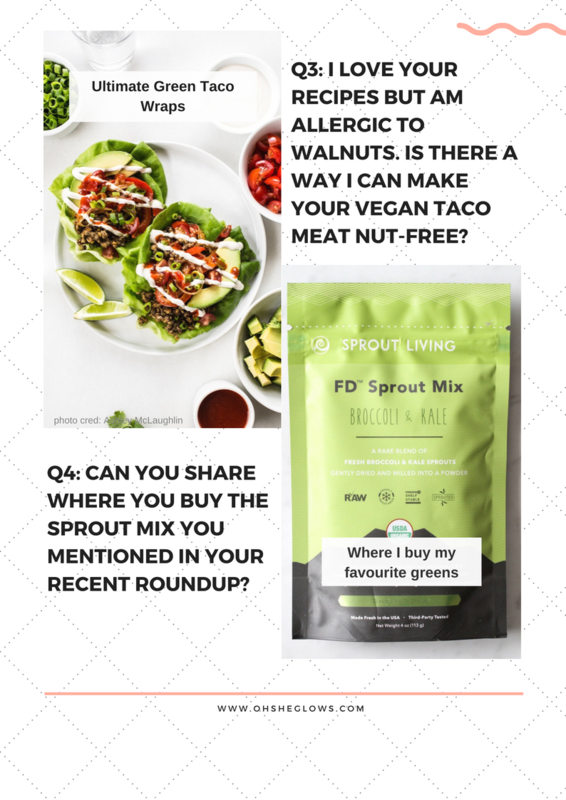 I am allergic to walnuts, peanuts, and sesame seeds, and am wondering what nut I can substitute for the walnuts in your Lentil-Walnut Taco Meat? I am thinking pecans or cashews, but I would appreciate your take. Thank you! Hey Yolanda, thank you! That’s so sweet of your friend to gift my cookbook. I often sub in toasted pepita seeds for a nut-free version of this taco meat (I’d recommend using 3/4 to 1 cup in this recipe). There is also a delicious seed-based taco “meat” recipe in my Easy Nut-Free Taco Salad from the app! The taco crumble is a great recipe to store in your fridge for the workweek too. Q4. 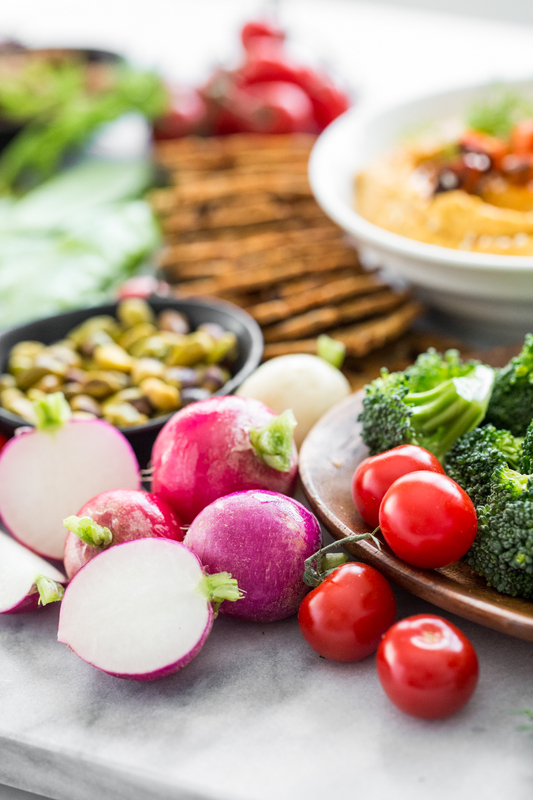 Hi Angela, thanks for posting about the nutrition powerhouses you’re loving lately. :) Could you post where you buy the microgreens and the Sprout Living Freeze-Dried Sprout Mix? Hey Gauri, I’m happy to share! I buy microgreens at Fortinos, Metro, Organic Garage, or Whole Foods grocery stores and the sprout mix from Whole Foods. When Whole Foods has their supplement and protein powder sale, I buy a few and freeze them for later use. You can also find the sprout mix online here. Q5. While I typically freeze soups/stews and snack foods like muffins and bars, I’m wondering if you have any suggestions for summer-friendly meal freezing? A lot of my go-to freezer meals are great for winter, but not what I would like to eat in the heat! Hey Christina, I love the idea of freezing summer-friendly foods! I never think to do that, but your question inspired me. 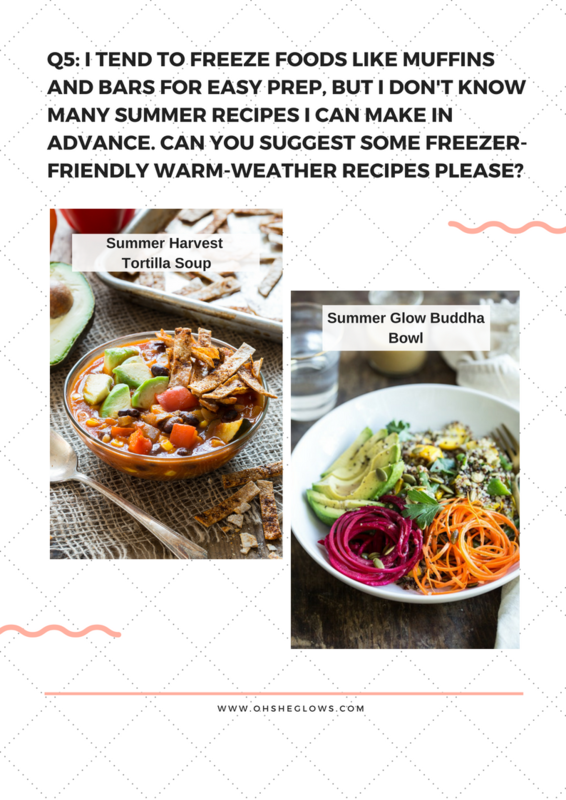 I rounded up some of my recipes for easy summer freezing below. I hope this helps get your wheels turning! “Hi Angela, I was recently at a 10-day meditation retreat at Elohee Retreat Center in Georgia where they used many recipes from your Oh She Glows Cookbook. I arrived at the retreat with a full-blown case of bronchitis (yes, I wondered if I should stay home) and left 10 days later healed and feeling better than I have in a long time. Sure, the meditation was a big factor in my getting better, but I am also convinced that the food was another huge reason. And I wasn’t the only person who constantly pestered the kitchen staff for the recipes! Long story short, I’ve gotten a copy of your book, but I’m also thrilled to find more recipes on your blog! Thank you for being you, and for sharing yourself with us. Hey Pam, thank you so much for your lovely note! The retreat sounds like it was a healing one. I’m so honoured that the chefs referred to my cookbook for their menu…what a cool way to share OSG recipes. I’m excited for you to dive into more recipes. There are over 600 on the blog alone so you may be a busy bee for the next little while. ;) Happy cooking! I like your veggie burger recipe; I added avocado to mine to make them more creamy. My Children love them when we grill them. I love the idea of adding avocado. Do you just mash it right into the mixture? Sounds creamy and delish! I mash them up and put them straight into the mixture! Thank you! Can’t wait to try it. I am making some desert finger foods for a bridal shower, and wondering which one of your recipes you would suggest- there is a main cake there but this would be to offer other baking, sweets on the site. I just brainstormed with Nicole and this is what we came up with. I hope it helps you with ideas! I have both your cookbooks and love your website!!! :) I was just wondering if you have any vegan rhubarb recipes for cakes, muffins or cookies. If so, please let me know where to find them. Grateful for all your vegan yummy goodness!!! Thank you so much for your kind words! So grateful for your support. :) Rhubarb is one of the few foods that I haven’t taken a liking to I’m afraid, so I don’t have any on the blog. I’m curious what other readers’ favourite ways to prepare it is though (especially for those of us who haven’t warmed up to the flavour!). Just discovered this site. Will be digging deeper into your content over the coming weeks! Hey Liam, I’m glad to hear the short ingredient list came at a good time! I’ve been referring to it a lot as it’s been a struggle to find time to cook and meal prep. I hope you discover tons of recipes on the blog too! Happy cooking. i remember you were taking Nutiva Mct oil… do you still ? Did you take 1 tablespoon ? And did you saw some benefits ? Thanks ! Yes i think it’s good for satiety too, thanks for your answer ! Hi Angela, I am a breast cancer survivor and am experiencing a lot of inflammation in my body. I keep hearing about anti inflammatory foods. Can you suggest some tasty recipes? Hey Angela, any chance you could share pictures of your garden and tell us about it? Hey Diego, My poor garden is pretty nonexistent these days I’m afraid, hah. But if we give it some work I’ll share some pics for sure! I have to say I love every single one of your recipes that I have tried. Your sweet potato black bean enchiladas are a go to at our house, and my meat-loving husband loves them! In fact, we have made a pact to try a vegan meal out of your books or the app at least once a week. I have a lot of food intolerances and find your recipe instructions super helpful with all the substitutions you offer. One thing I wanted to ask about substituting is coconut milk. I can’t have it at all and wonder if there’s anything you have found to use instead? I recommend your cookbook to everybody. Aww thank you! I’m so flattered the recipes have been such big hits with you so far. :) I’m craving those enchiladas now, haha. Hey Marion, Aww this comment made my day!! Thank you! I’m so glad you saw the page. And I will pass along your kind words to my team. Thanks so much for all your support for the app too. I just wanted to tell you that I have been enjoying your website and recipes for several years now (I even bought my my mom your cookbook and she uses it all the time!). I went mostly paleo for a few years and hadn’t been to your site in a while, but I am coming back around to a more vegan-centric diet. In re-visiting your website, I still love your recipes and site format! I also love that you support so many different diet types, offering modifications and suggestions. Thank you for being so responsive to your readers and creating so many yummy recipes! Hi Angela, I just got your OSG Every Day and I absolutely LOVE the Ultimate Flourless Brownies!!! I confess that I ate half the pan before I could stop. Can I make a bigger pan to take to a church potluck? Say double or triple the recipe? I only have one 9 x 6 pan. There are quite a few GF parishioners at church who would absolutely faint with joy! One person is allergic to soy lecithin, but cocoa doesn’t have it, right? So if I only use cocoa they should be able to enjoy the brownies. Thank you for all the great recipes! We Love the curry recipe from OSG, we have it 3 or 4 times a month- it is a frequent meal at out house. Hey Dianne, I’m so sorry for the delay in reply! I missed your comment somehow. Apologies if I’m late! To be honest, I’ve never made a double batch of this recipe, so I can’t say for sure. I can’t see why it wouldn’t work, but sometimes doubling baked goods can produce slightly different outcomes for whatever reason. If you try anything I’d LOVE to know how it goes! I agree that a pan is too small sometimes. :) My cocoa powder doesn’t contain any soy lecithin. are you a vegan because of the health aspect or because you think about the environment/the animals? I will be looking forward to your new OSG blog page. :) I am also interested in short ingredient recipes. It’s my first time on your page and I got a lot of ideas already. Would love to try those at home. Thank you and more success in the future! Hey Alexa, I’m so happy to hear that! Thank you so much for the kind words :) I hope you find many new recipes you love! I bought the ebook of ” Oh she glows” from Itunes and Itunes say the content was changed and the book was removed from my iBooks library. Can you help? I Tunes says I must buy it again. Hey Fara, Oh no that is so weird. I haven’t heard of that happening. I would suggest reaching out to itunes/ibooks with what happened. I’m sure they can get it restored for you. If not, please let me know. My question is this: How do you feel about the baby-booming population and supporting a healthier eating style for most of America’s Seniors? Myself, I am a big supporter of the local farmers and organic farmers. I have discovered so much nutrition and goodness in all this delicious plant life that is available to us and doesn’t cost an arm and a leg. Also the variety of vitamin supplements is a great back up system for the body. I don’t feel my age (which is 66 years old) and haven’t had any colds or flu in the past 4 years. Age is just a frame of mind, cause I still got a lot of youth keft in me. I LOVE your attitude and approach to healthy living…so inspiring! Thanks for sharing. I hope you enjoy some recipes around here…I’d love to hear if you try any out. I have a 11 month old daughter and am in a lunch box rut. Do you have any lunch ideas for an almost toddler? We have to send a bento box with finger foods to daycare and end up sending the same few things over and over again. The daycare is completely nut free. P.S. : Love your blog and your cookbook btw! Thanks Helen! I’m sorry for the delay in reply I missed this somehow! In your creamy cherry pie fruit dip I misread the first step and soaked the cashews in almond milk instead of in water. Will that ruin the dip? I don’t have enough time to restart. Hey Kacey, I think it should still work out…I’d love to hear how it goes!